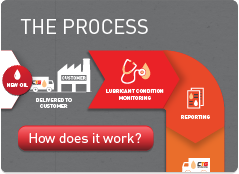 Lubricant is monitored to determine the current condition and combined with previous results to provide a lubricant condition trend. Report percentage remaining useful life (% RUL), remaining additive content, water contamination and ISO rated oil cleanliness to identify when lubricant renewal is required. With lubricants, "The most effective water removal technology is vacuum dehydration" (www.reliabiltyweb.com). Water removal is performed continuously using vacuum dehydration in the PROPEL process. Critical additives, that are present in new oil to protect the base oil, are replaced in the same concentration levels as found in new oil. To certify and report that the renewed lubricant meets or exceeds new oil specification. Lubricants can be filtered to as low as 1 micron and ISO cleanliness to the most demanding specifications. With lubricants, “The most effective water removal technology is vacuum dehydration” (www.reliabiltyweb.com). Water removal is performed continuously using vacuum dehydration in the PROPEL process. Critical additives, that are present in new oil to protect the base oil, are replaced in the same concentration levels as found in new oil. This process effectively brings the lubricant back to as good as new specification or in some cases, higher.